Father John McLoughlin, C.Ss.R., of Our Mother of Perpetual Help Parish and School in Ephrata, Pa., will be among those receiving the 2015 Distinguished Pastor Award from the National Catholic Educational Association (NCEA) for his dedication and commitment to excellence. 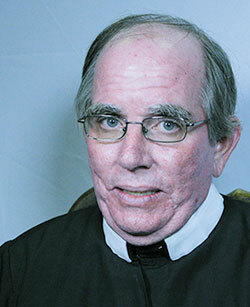 Father McLoughlin, 57, belongs to the Baltimore Province. He was ordained in 1992. The distinguished pastors will be recognized during the annual NCEA Convention & Expo set for April 7 to 9 in Orlando, Fla. Pastors, principals, and teachers who have demonstrated a strong Catholic educational philosophy—as well as exceptional ability, dedication, and results—will be honored during the organization’s annual awards ceremony. During his 23 years as a priest Father McLoughlin has been closely involved with both elementary and high school education. Continuing in the tradition of his Redemptorist confrere, St. John Neumann, the fourth bishop of Philadelphia, Father McLoughlin has emphasized the value and importance of Catholic education. “Sharing my love of Jesus with students in the classroom is not only rewarding for me but also brings me a great sense of joy,” said Father McLoughlin. Father McLoughlin has been pastor of Our Mother of Perpetual Help since July 2011. His previous assignments include mission work in Dominica and St. Croix, U.S. Virgin Islands and St. Wenceslaus in Baltimore. Established in 2007, the annual award has been met with an overwhelmingly positive response from dioceses that welcomed the opportunity to recognize priests who have been outstanding in their support of Catholic schools. School superintendents are encouraged to nominate pastors for the award in collaboration with a school’s principal and with the approval of the local ordinary/vicar. * have a minimum of three years’ service as a pastor in a parish associated with Catholic elementary education.